Performance issues in Microsoft Windows system can be fixed by finding the running process at given time and also it will help to understand how our CPU and other resources are being used . Process Explorer is the most popular tool and it can be downloaded from sysinternals. 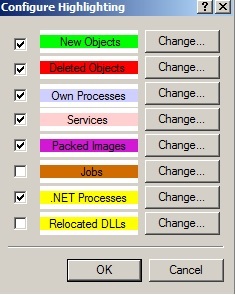 Windows has always included the task manager to find the processes that are running on our system but it often doesn’t provide the deep enough information but in Process Explorer we have so many key features which helps to drill in to what was happening on a windows system from a process perspective.As a Windows Administrator we should know the features of the tool and I have described below some key features which was taken from the Windows Sysinternals Administrator’s Reference book by Mark E. Russinovich, Aaron Margosis and I hope it will give some idea about the functionality of the tool and I would highly recommend this book for the more information. Color coding to identify the process type ,such as services,.Net process, process running as the same user as procexp, process that are related to job and packed images. Highlights to call attention to new and recently exited process. More Accurate indication of CPU consumption based on CPU cycle. Identify which process owns any visible window. Detailed metrics of memory usage and I/o and TCP/IP endpoints. Graphical representation of CPU activity, memory usage and I\O activity, both system wide and per-process. Process list is a table in which each row represents a process on the system and the column represent continually updated attributes of those process. Light blue :: process that run on same user group account as Procexp. Dark gray : indicate suspended process. These are process in which all threads are suspended and cannot be scheduled for execution. If the process belongs to more than one categories, the precedence order is packed,.net,jobs,services , .net process because it has higher precedence than services.. Newly process will be in green color for one sec and when it exit it will remain in red color for one second. We can change the color by selecting configure highlight..
Each Column in the process represents some static or Dynamic attribute of the process and Dynamic attributes are updated at each automatic refresh interval. Pls find the default setup. Private bytes – no of bytes allocated and committed by the process for its own use and that are not shareable with other process. Memory leaks are often exhibited by a continual rise in this value. Working set – Amount of physical memory assigned to the process by memory manager. Description and company name : Extracted from the version info resources of the exe image file. Tool will populate only if it identify the path to the file and read from it which also need admin rights. Process tree- Tool shows all the process in tree format which also includes ascending and descending mode.It shows the process parent\child relationships.Whenever a process creates another process,Windows puts the Process ID ( PID) of the creating process ( the parent ) into the internal data structure of the new process ( the child). 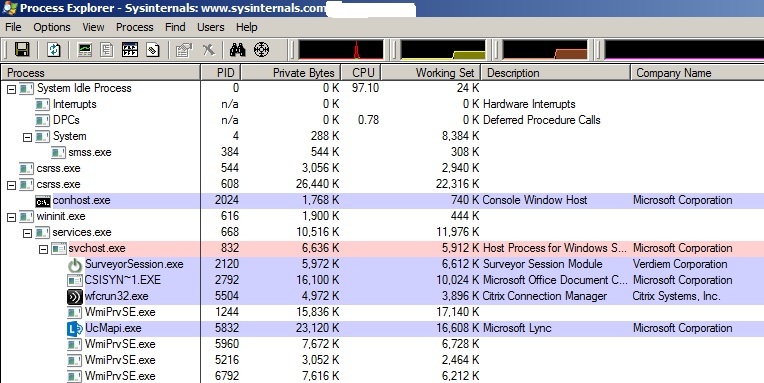 System Ideal process – called IDLE by some utilities and it has one thread per CPU , which is used to account the CPU ideal time when windows are not running any code. Since its not the real process the PID will be 0. System process – it host only kernel mode system threads which only run in kernel mode , this threads execute operating system code from ntoskrnl.exe and device driver code. Interrupts – pseudo ( virtual) process represents kernel- mode time spent servicing the interrupts and deferred calls. Startup sequence changed between widows XP and vista. exe lanches explore.exe (user shell application) and then exited. System process starts an instance smss.exe , which remains running until system shutdown , that smss.exe launches two new instance one in session 0 and one in session 1. This entry was posted in Tools, Windows and tagged performance, Windows Tools. Bookmark the permalink.